Most of the LAPD officers who have died on the line of duty have been the victims of gunfire, or vehicular accidents -- automobile, motorcycle or, more recently, helicopter. Of the 200-plus officers who have died in the line of duty, only one died from electrocution -- Officer Orley O. Sanner. Sanner was born in Kansas, the eldest of four children of William and Alice Mary Strunk Sanner. Sanner's father worked on farms throughout the Midwest, and the family moved from Kansas to Colorado before settling in Oklahoma while Sanner was still a teenager. Sanner moved to Oklahoma City in about 1915, staying with his aunt and uncle, Hugh and Essie Sanner. He attended school, then worked for the Oklahoma Railway Company. After his discharge, Sanner returned to Oklahoma City, and his job with the Oklahoma Railway Company, then as a driver with the Marland Refining Company. 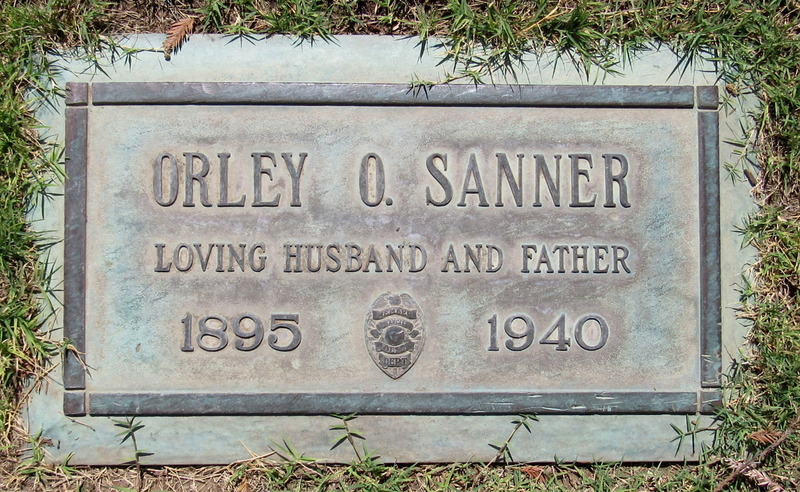 In the early 1920s, Sanner and his mother moved to Los Angeles, and he joined the LAPD in 1925, working first as a traffic officer. In May 1931, the LAPD opened its first radio dispatching station on a hill in Elysian Park, and Sanner was one of the department’s first radio operators. On April 8, 1933, Sanner married Beatrice Eugenia Bartholomew. They had two children -- Thomas Myron Sanner, born in September 1934, and Donna Jean Sanner, born in April 1937. In early 1940, Sanner was living in a home on Peach Avenue in Van Nuys with his wife, their two young children, and his mother. On Sunday, May 26, 1940, Sanner was working at the police radio dispatching station in Elysian Park -- a location now known as Radio Hill, just north of Chinatown, and across the 110 Freeway from Dodger Stadium. Beginning at about 2 a.m., police officers in patrol cars noticed silence on the department's radio frequency, KGPL. Calls were made to the dispatching station, but there was no response. Officers raced to the station and climbed over a security fence to reach the transmitter building. Inside, they found Sanner, sprawled on the floor. Medical emergency personnel worked on him for about 30 minutes before he was declared dead. Apparently, Sanner, 44, had gone behind a control panel to check on the equipment or make an adjustment, and an electrical short caused him to suffer a heart attack. Police officials noted that a fuse was blown out in the broadcasting station, and they said that the circuit didn't carry a particularly high voltage, but it was enough to disrupt the rhythm of Sanner's heart. In addition to his mother and widow, Sanner left behind a son, 5, and a daughter, 3. Sanner was buried at Forest Lawn Memorial-Park in Glendale. Sanner's sign is located on the west side of North Broadway, between Solano Avenue and Casanova Street, southwest of Radio Hill -- and directly beneath a large sign with directions to the L.A. Police Academy. Special and sincere thanks to Officer Sanner's granddaughter, Tracy Heineck, for valuable assistance with the preparation of this article, and for sharing family photos and information.